For the second straight season, the Oklahoma women's gymnastics team has earned the nation's No. 1 overall seed heading into postseason competition, the NCAA announced today. The Sooners were tabbed as the top seed in the Iowa City Regional, where they will face No. 12 Nebraska, No. 13 Arkansas, Iowa, Kent St. and Central Michigan on Saturday, April 2. OU, which holds a nation-best regional qualifying score (RQS) of 197.920, will aim for its seventh consecutive regional title and a 13th straight NCAA Championship berth at regional competition. Last weekend, the Sooners became the first team to capture five straight Big 12 titles, doing so with a score of 198.050, the highest championship score in conference history. The regional will mark the second time the Sooners have faced Arkansas this season and the first matchup with the other four squads. 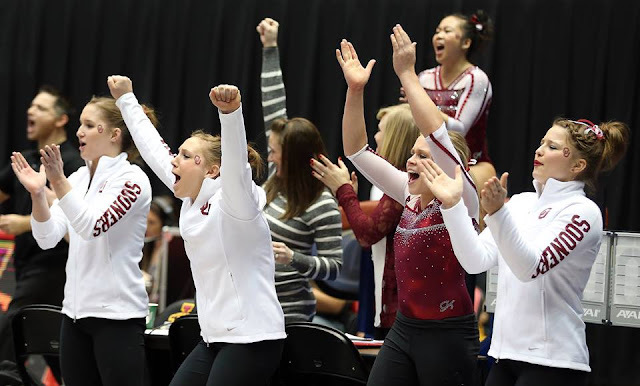 On Jan. 17, OU snagged a 197.050 to 195.900 road victory over the Razorbacks in Fayetteville, Ark. In addition to qualifying teams, Oklahoma will face individual all-around competitors and event qualifiers from Ball St., Centenary and Western Michigan. The top two finishing teams from each NCAA regional will advance to the 2016 NCAA Championships in Fort Worth, Texas. The meet is set for April 15-16 in the Fort Worth Convention Center. Semifinal competition will take place on April 15 and the Super Six team finals are set for April 16. The Iowa City Regional is set to begin at 4 p.m. CT inside Carver-Hawkeye Arena. Tickets are available for purchase online.